RootsTech – Let the Games Begin! Wednesday started right off with sessions. There was no morning Keynote and the Expo Hall wasn’t open until the evening. Today was the first of my labs that I had signed up to take. I took my first lab last year and it was great. You pay extra for it but the class is smaller and you usually have hands-on experience. My lab was Share Your Family’s Story with Custom Google Maps. This was an interesting lab and we learned how to pinpoint places of interest for our family as well as link them with stories and pictures. After my lab I had a meeting with MyHeritageDNA. 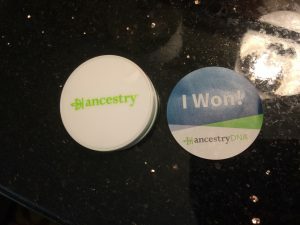 Before RootsTech they put a request out on Twitter for anyone going to RootsTech who would like to take a free MyHeritageDNA test and then provide some feedback on the results and their experience. 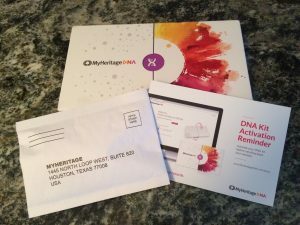 So I said I was interested and was chosen to do a free MyHeritageDNA test. It was an interesting process. I have tested with all but one DNA company. I am a first generation Canadian, my parents are immigrants. I don’t usually find many matches that can be connected through my research but on MyHeritage I found two second cousins in the UK who had also taken the test. Tried to get into a few sessions but the line ups were very long. They had a bar code on our name tags and everyone was being scanned before entering a session room. This backed things up a little. So I went back to the Family History Library to do more research. I didn’t worry about a couple of the sessions because they were being live streamed and knew I could watch them at home. Ancestry had an additional booth that was located in the main hallway. 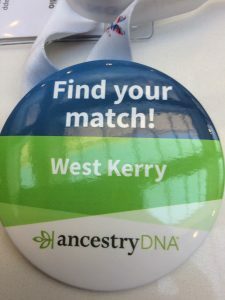 They gave out buttons with country/place names on them and you had to find your match. You then returned to the booth with your match and you were each able to pick out a prize. They took your button and you were given a sticker. One booth in the Expo Hall had a white board with people who were looking for their matches. I finally found mine on Saturday afternoon and it was one of the attendees of Family Discovery Day. I won a USB port. Then there was a General Session at the end of the day featuring FamilySearch’s own Steve Rockwood. He is always a thoughtful and entertaining speaker. He spoke about the emotional side of family history and FamilySearch’s efforts to preserve documents that were in dire need of rescuing. 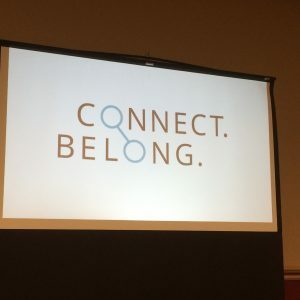 Living DNA was a sponsor at RootsTech and David and Hannah did a presentation talking about the new innovations they were working on. Then there was a panel discussion about the future of genealogy records. You can watch Wednesday’s live streaming videos here. After the General Session then the Expo Hall opened up. First I had to accomplish my mission. 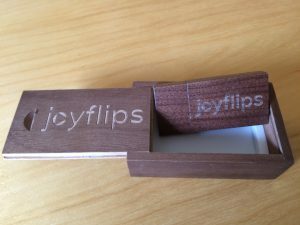 I had heard that JoyFlips were giving away a FamilyArchive Kit for free so I found their booth and received a special memory stick to download my images from their app. Do you know about their app? You can find out more here. This is something I am learning to use as I have just inherited boxes full of photographs and slides! The Expo Hall was great fun. I found booths that I wanted to learn more about and some that were new. I used the app at home and highlighted booths that were of interest to me and then located them on a map so I could find them. Expo Hall is enormous! Maps are a necessity! Then it was back to the hotel to get ready for an early start the next day! 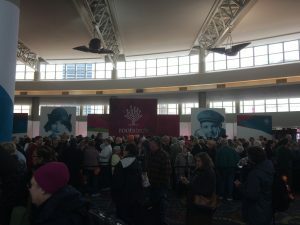 It has been a couple of months since I returned from RootsTech and things have been very busy since I got home hence the delay in my RootsTech posts. 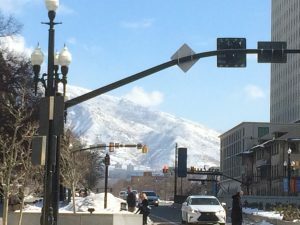 I arrived in Salt Lake City on Sunday evening. Imagine my surprise when before we even left Toronto we were told we would be 45 minutes early into Salt Lake City. The winds were with us but the pilot said he would have to slow down the trip as a gate wouldn’t be ready for us so we were 25 minutes early which was still good. Salt Lake City Airport on a Sunday evening was packed and people were arriving from around the world. Monday was my first full day in Salt Lake City and I found the grocery store to get a few necessities in for the early morning starts later in the week. Then it was off to the Family History Library. I had decided to search the early Irish civil registrations that aren’t available yet on irishgenealogy.ie and are available digitally only at a Family History Library. I was working on two surname studies on my Toppin and Moon families. These lines have been hard to nail down and I thought a surname study might help. They are not common names in Ireland so hopefully I can find something to help with my own lines. Haven’t had a chance to sort through what I brought home yet but they are waiting for me. Monday night was dinner at the Blue Lemon with a large group of Commonwealth Nations genealogists. It is always a fun night catching up with everyone we only connect with on social media. We were sharing travel stories, Family History Library experiences and other family history tales. 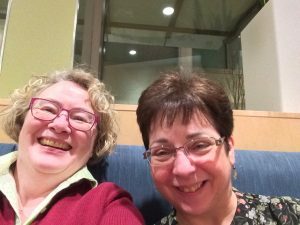 I got to meet up with the winner of my RootsTech Pass! Tuesday morning was spent at the Family History Library and then I went to line up for registration. There were long lines for registration but the RootsTech people were doing their best. 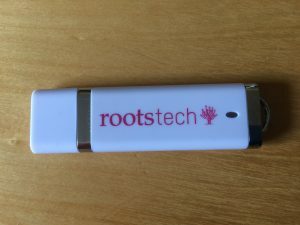 We were told that those who signed up early would get a free gift which was the whole RootsTech syllabus on a memory stick! This was great! I have downloaded mine to several places to save for future reference. Once registration was complete it was back to the Family History Library to finish up my research. Tuesday evening was the Media Dinner at the Salt Palace Convention Centre. The RootsTech Ambassadors come from all walks of life not just genealogy so it was fun to meet so many new people. I also decided to sit at a table where I didn’t know very many people which was even more fun. I met people from Michigan who I will meet again in May at the National Genealogical Society Conference. I got to catch up with friends I hadn’t seen yet and made some great new friends. We were told about the Photo Story competition and they showed the pictures up on the screen during our meal. One of my friends saw the picture of her family up on the screen so a large whoop went up from the table. 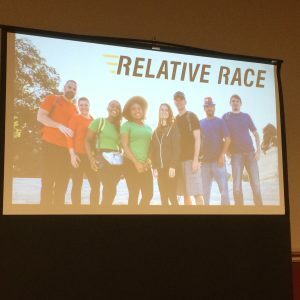 Relative Race gave us a preview of the first episode of season 3 that was to air on the following Sunday evening. Did you know you can watch this show online? You can watch it here. There were prize draws at the table and it was just a fun evening of learning, preparation and camaraderie. Then it was back to my room to get some rest before the start of the first day of RootsTech. It started a day early this year and there were some new methods used as well. Weeks Away from the Start of RootsTech! We are weeks away from the start of RootsTech 2018! This is an event I look forward to every year. At RootsTech you get the chance to catch up with friends from around the world and to meet people you have been following on Social Media. RootsTech have also switched up a few things for 2018. RootsTech will now start on Wednesday February 28th instead of the Thursday. The Keynote Speakers this year are varied and interesting. On February 28th Steve Rockwood the CEO of FamilySearch International will be speaking. He gave a great talk last year that even included a recipe for his Mum’s fudge. On March 1st the Keynote Speaker is Brandon Stanton. He created “Humans of New York “and this concept has been used in other cities around the world. I am looking forward to hearing the stories of his adventures. March 2nd will see Olympic Gold Medalist Figure Skater Scott Hamilton take the stage as Keynote Speaker. He has faced and overcome many challenges in his life and his stories will be inspirational. Henry Louis Gates Jr. will be a Keynote Speaker this year! He is the host and storyteller of “Finding Your Roots” on PBS. I am looking forward to hearing about his research adventures. On March 3rd Natalia Lafourcade will be the Keynote Speaker. She is a Mexican pop-rock singer and songwriter. She sang “Remember Me” in the movie Coco released last year. 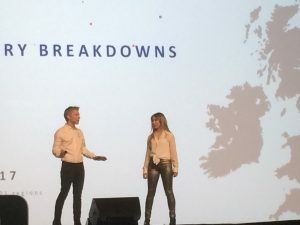 The Keynote Speakers this year cover wide and varied life experiences. Their stories are sure to motivate and hit an emotional chord with everyone. 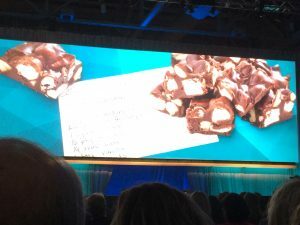 There are many lectures and labs to attend during RootsTech and the main problem is not enough time to see and do all you want to accomplish during the conference. I have signed up for one lab and have quite a few other sessions on my agenda. There are some for geographical areas that I am interested in attending as well as trying to learn more about DNA and of course organization and preservation. They have a stream for Getting Started for those just beginning the family history journey and they will have Family Discovery Day on Saturday where the entire family can come and learn about family history. It is great to see the children excited to learn more about the joys of family history. On Wednesday morning there will be an Access and Preservation Track sponsored by ProQuest and FamilySearch. Another new happening this year is that the Expo Hall will open from 6-8 pm on Wednesday night for a sneak peak of what you can expect. This RootsTech event is offering so much to attendees. There will also be some live streaming of lectures and some of the Keynotes for those who can’t attend in person. You can still decide to come and join us in person. Registration is still open. You can get a discount on the fees until February 12th at 11:59 MST by using the promotional code 18FLASH. I look forward to catching up with old friends and meeting new friends in Salt Lake City at RootsTech February 28th to March 3rd. See you all there. Have a safe journey everyone! We have a RootsTech Pass Winner! And we have a winner of my RootsTech Pass giveaway! Yvonne writes Yvonne’s Genealogy Blog. Looking forward to meeting you at RootsTech 2018 Yvonne! 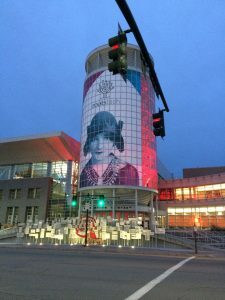 Time for the Passionate Genealogist’s RootsTech Pass Giveaway! As a RootsTech Ambassador I am allowed to give away one complimentary RootsTech 2018 4-day pass valued at $279 US to one of my followers. 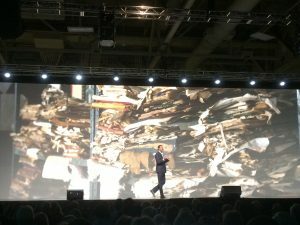 RootsTech runs from 28 February to 3 March 2018. This does not include hotel, flight, meals or any extras. You can find out more about RootsTech on their website just click here. 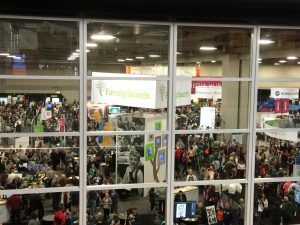 RootsTech is a fantastic conference and there is lots of activity on-site and online. If you have ever wanted to attend RootsTech now is your chance to win a free pass. How do you enter? 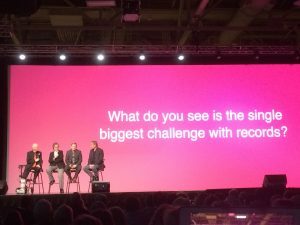 Leave a comment on this post and tell me why you really want to go to RootsTech 2018 then tell me the one thing you must do/see while at RootsTech. The contest will close on 14 November 2017 so add your comment to this post now!